Last year I started a new tradition with the girls -- In addition to chocolate advent calendars, I began a 12 days until Christmas book advent, where the girls would get to unwrap a new book a day leading up to Christmas. They loved it, and loved being able to share and instill a love for reading with them, as they filled their bookcases with new books, that they still continue to pull from the shelves and ask me to read them to them at bedtime, or whenever they want to hear a good story. By the time December 1st rolled around and we pulled out the chocolate advent calendars, my oldest, Savannah, was quick to ask if we would be doing the book advent again. She loved this and was so hoping to do it again. She even had a few suggestions for books she wanted, based on book catalogs we picked up at the local bookstore showcasing holiday selections and new releases. When I said "Yes," her eyes lit up and she was so excited. And, from that day on, she would ask if today was the day that we would be opening up a wrapped book to read and enjoy. In a few short days -- well, five days to be exact, we will begin another fun holiday tradition, where the girls will unwrap a new book and we will snuggle up together under a cozy blanket on the couch and read it together. I, for one am looking forward to this, and I know my girls are, too, as they can't stop talking about it! "When Big Snowshoe tells Little Snow that the animals’ Santa is coming with presents for everyone, Little Snow wants to know who he is. The animals say they have never seen him. Maybe he’s a badger, a moose, a polar bear, or a wolf, they tell him. But this spunky little rabbit thinks they are just fooling him. On Christmas Eve, Big Snowshoe finds a way to see the animals’ Santa when a Snowy Owl in a red cap swoops down with a pack full of presents. Never again will an excited Little Snow doubt that there is an animals’ Santa." I have been a fan of Jan Brett's books for years, and last year I surprised my girls with a couple of Jan's books as part of our book advent, icnluding "The Three Snow Bears" and "The Mitten." If you were to check out my daughters' bookcases you are bound to find a dozen, if not more of Jan Brett's books. And, being from Massachusetts, where the author lives with her family, I love being able to support local authors and share their books with my family. This is a cute story about a bunny names Little Snow who wonders if there is an animals' Santa, that comes at Christmas to deliver presents to all the forest animals. As you flip throught this book you will not only be greeted with whimsical and fun illustrations that tell the story as it unfolds, but you will also find a border illustrations that share additional illustrations of the forest animals as they prepare for Christmas. It isn't until the last page the Little Snow finds out who is the animals' Santa. Don't worry, I will not ruin the ending for you. Just know that if you are a true believer of the holidays then you will definitely love the ending and find this book to be a great addition to your annual Christmas reading. 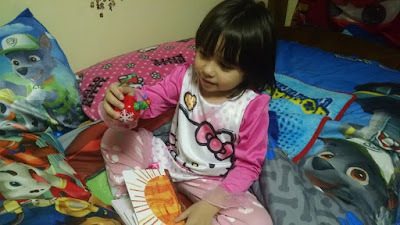 "Merry Christmas, Hello Kitty! is a 64-page full-color activity book that comes with tons of games to play, like puzzles, mazes, seek-and-finds, and more–starring Hello Kitty, of course! As a bonus, the book includes a sheet of stickers, perforated holiday greeting cards, and a pull-out poster. The book is in stores just in time for the holidays. You can pick one up for only $9.99!" This sticker and activity book is filled with mazes, crossword puzzles, matching games, holiday garland, decoding games, word games and so much more. You will even find recipes that your kids will enjoy getting in the kitchen to bake with you. I ended up picking up a second copy as we were only sent one to review, as I knew each of my girls will want a copy for themselves. And, with upcoming long car rides to visit family and friends, dining out or simply looking for some quiet time activity, this book is sure to come in handy to keep the girls engaged and entertained. If you have a Hello Kitty fan in your life, why not consider picking up copy of this book. If you do pick up, I recommend sharing prior to the holidays as the books including countdown garland, letters to Santa and more that will make counting down to Christmas that much more fun. "Fans of the best-selling Dragons Love Tacos will devour Adam Rubin and Daniel Salmieri’s newest story, a hilarious picture book about robots that magically transforms into a super shiny metal ROBO-BOOK. Giggle at the irreverent humor, gasp at the ingenious fold-out surprise ending, and gather the whole family to enjoy a unique story about the power of imagination. It’s picture book technology the likes of which humanity has never seen!" "Everyone’s favorite dancing mouse is back on the big stage! Angelina is playing the lead in the Cinderella Dance Tour that is traveling across Mouseland. The final stop on the tour is at the grand Von Whiskers Castle, but just before the performance, the scenery is ruined! Angelina and her friends know the show must go on, but how? This new story features all the hallmarks that readers love about the Angelina books: fluffy dresses, charming friendships, colorful illustrations, a sparkling cover, and, of course, ballet! Timeless and utterly delightful." Back when Savannah was around 2 years old, her world revolved around Angelina Ballerina. 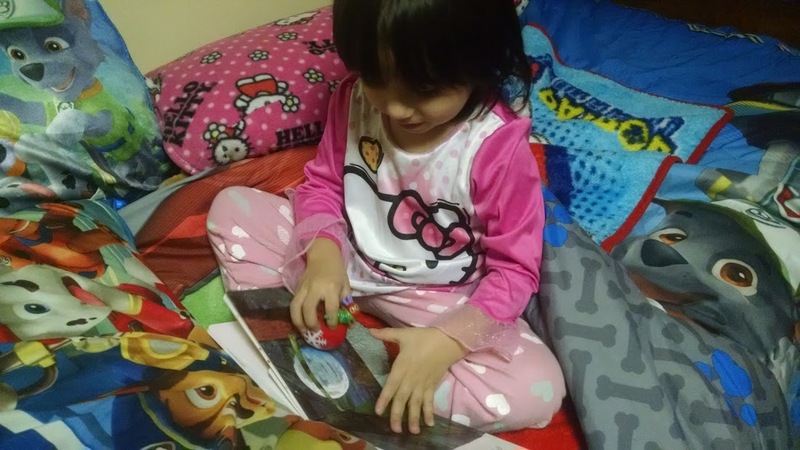 When she wasn't wearing her pink tutu and dancing around to Angelina Ballerina and her friends on television, she was playing with her plush Angelina Ballerina toys and/or having me ready one of her many Katharine Holabird books to her. But, then she moved on to liking other characters and things and it seemed like Angelina Ballerina fell to the waistside. But, when Savannah saw this book at the bookstore recently, she asked me to add it to her Santa wishlist. I couldn't help but smile as I was happy to see her getting excited about Angelina Ballerina again, as it has become a personal favorite of mine since we started to watch it a few years back. I know that when Savannah unwraps this book soon she will be all smiles and will be eagerly awaiting bedtime to cuddle up with me and read all about Angelina's Cinderella. Fans of the author will appreciate the playful illustrations that portray the classic non-animated/television version of Angelina Ballerina. I, for one, am a fan of this classic looking Angelina Ballerina, and love the story. It truly is a delight to read and will become a favorite once the girls see it. "The companion to the #1 blockbuster bestseller, The Day the Crayons Quit! Look for a special glow-in-the-dark picture [Note: make sure to “charge” it under a light first]." I was excited to learn of this new release as my girls continue to ask me to read the ever popular bestselling book, The Day the Crayons Quit!, at least twice a week at bedtime. I know they will love seeing this book and having me read to them all about Duncan's new group of crayons needing to be rescued. Through the use of postcards written by the crayons, this book will surely delight children young and old, as they root for the crayons to be returned home safely to their crayon box. Oh, and don't forget to take time to enjoy the special glow in the dark page. I know this will be a personal favorite and page that the girls will want to linger on when we finally get to read this book together for the first time, and then the many more times thereafter. "Cat took on a bunny in Here Comes the Easter Cat, but now Christmas is coming, and Cat has a hunch he’s not on Santa’s “nice” list. Which means? No presents for Cat. So he tries to be good, but children, it seems, aren’t wild for his brand of gift-giving. Still, Cat might surprise himself, and best of all, he may just get to meet the man in the red suit himself—and receive a holiday surprise of his own. Fans of Pete the Cat, Splat the Cat, and Bad Kitty will delight in this holiday treat." Savannah is all about cats. She can't get enough of them and continues to ask for a cat as a pet, even though she knows that my husband and her Nana are allergic to them. While she can't get a pet cat, I don't mind letting her fill her bed and bookcase with cat plush toys and books, which will soon include this cute holiday tale. This book contains more pages than I used to reading to the girls -- 88 pages to be exact. But, once you start flipping through this book you will find that most pages only have a handful of words at most, with many other being blank. So, it will be a quick read. Perfect for young children ages 3-5 years old, this children's book which contains playful colored-pencil cartoonlike illustrations will have you and your child lingering after you read the pages, just to admire and take in the beaituflly detailed illustrations of this Santa cat. This story is truly one that will bring a smile to you and your child's face and would make for a great holiday read to share year after year. "Introducing Yeti, a fuzzy and sweet new character whose story is perfect for summer, winter, and all the seasons in between! Everyone knows yetis love winter. They love snowball fights and hot chocolate and sledding and building snow castles. But even yetis get the shivers, and even yetis get crabby from all the cold. So here’s a secret about yetis: sometimes they miss summer. Sometimes, they have to bring a little bit of summer to the coldest of winter days. Those yetis, they’re just full of surprises. Perfect for fans of Love Monster and the Cat books by Deborah Underwood, this endearing new character will warm your heart." This is another book Savannah saw in a book catalog recently and asked about. She thought the Yeti on the front cover looked cute and didn't care what the story was about. :-) This book while it looks like a winter book is all about enjoying the four seasons and all that each offer. And, with that being said, this is one book you will find yourself sharing throughout the year with your child as you welcome in a new season. But, for right now, this book is perfect to talk about winter and the fun things Yeti's enjoy doing in the cold snowy months like having snowball fights, sipping on hot choloate and building snow castles. As you flip through the pages of this book you will find your eyes lingering to enjoy the playful illustratons that capture the different seasons and their beuatify so wonderfully. I found myself wishing for summer as I saw the Yeti buidling sand castles, but also hoped for a white Christmas so that we can get outdoors and build snow castles and make snow angels. Even thougth Savannah has no idea what this book is about or even what a Yeti is, I know that when I read it to her for the first time, that is will be become a favorite, not just because of the cover art, but because of the cute story detailing the joy and wonder of the four season. “Happy” has had the world dancing ever since it first hit the airwaves, and now the irresistibly cheerful tune will come to life on the page with Pharrell Williams’s very first picture book! A keepsake and true classic in the making." Fans of both the Minions and Pharrell Williams will love this book, which is simply a picture books featuring the popular "Happy" song in a fun new way. With the use of photographs of children from all across the world and with different cultural backgrounds, readers will be able to see what it really means to be "happy." Be warned, if you found yourself getting this song stuck in your head when you heard it on the radio or played during the Despicable Me movie, then you will probably find yourself singing it again, after your read through this picture book. But, is it really a bad thing, as I find myself smiling as I sing and make up a fun dance to the "Happy" song. And, my girls love to join in and show off their happy dances, which makes for a more memorable time together. Savannah asked me again last night about the book advent and when it would be starting. She was so hoping it was the 12th already so that she could unwrap a new book for bedtime. If you know me, then you know how hard it is to keep a secret or hide a gift from my family and friends, especially my girls. I get really excited and can't to share things with people. And, last night, I broke from tradition and ended up giving Savannah one of her twelve books early. I knew she would be over the moon excited about this particular book as she had personally requested it, and even went as far as cutting it out of the book catalog and taping it to her wall, as a reminder to buy when she saved up enough allowance money. So, what book did I surprise her with, that she absolutely loved? 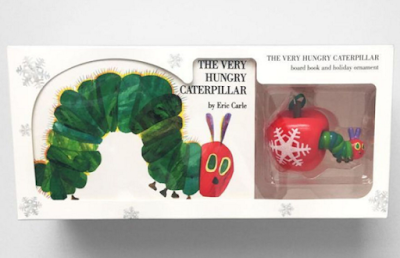 It was none other than The Very Hungry Caterpillar book and ornament box set. This book was my daughter's first introduction to Eric Carle and was the first book she memorized and can share or enjoy on her own. 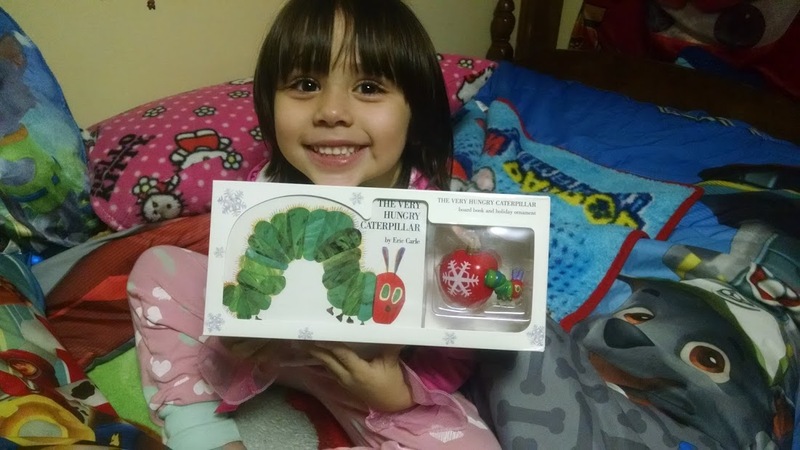 If you ask her what her favorite book is, she is quick to say "The Very Hungry Caterpillar"... of course. What I loved most about this box set was the ornament as I knew it would hold special meaning and would be treasured for Christmas' to come when we'll hang it on the tree. 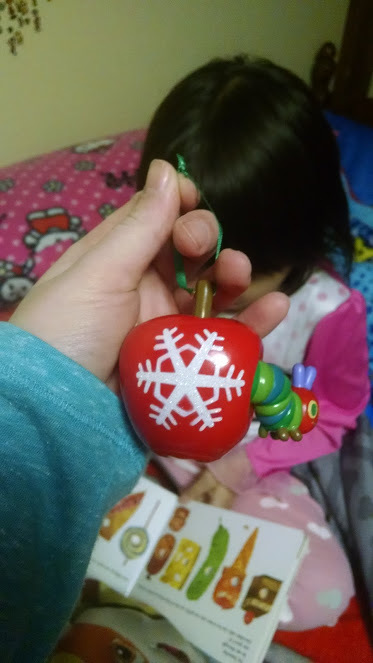 Another tradition I have with my family is buying a couple of new ornaments a year based on my girls' likes at that time. 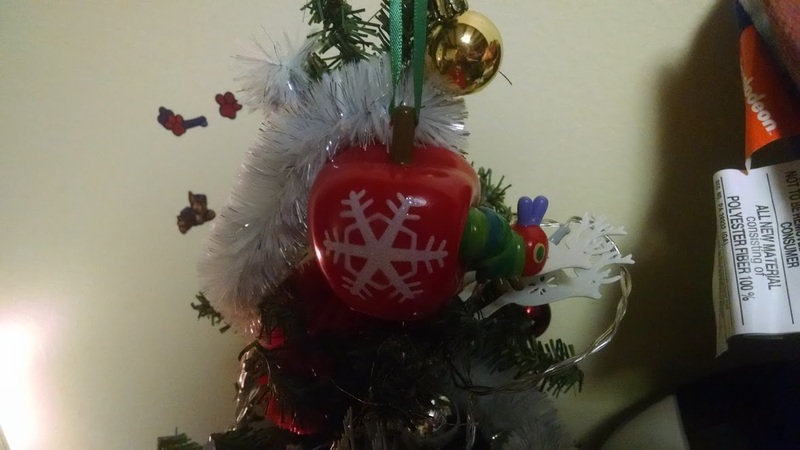 I mark the ornament boxes so that I remember the years. Then, each year when we put the ornaments on the tree and the girls reach for their special boxes of ornaments (which I will pass down to them when they get older and move out on their own), we talk about why the ornament is so special. And, as the girls and I eagerly await for December 12th to arrive so that we can start unwrapping our new books and kicking off our annual "Countdown to Christmas with a New Book" tradition, I can't help but share the above books in hopes that they may find their way onto your child's bookcase or under the tree for them to find on Christmas morning. Penguin Random House never disappoints when it comes to children's books, and I am so pleased with the above titles and know my girls will love them just as much as I do. To learn more about the above mention books as well as others available, visit the Penguin Random House website today -- http://www.penguinrandomhouse.com/. 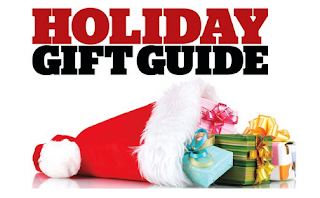 I can't wait to hear about the books you pick up to share with your children this holiday season. These look adorable and perfect for stocking stuffers. I really love The Animals Santa too cute.